Torrential rains in Chennai have brought the city to a standstill. Army has been deployed for round the clock rescue and relief operations. While the Indian meteorological department has forecast more rains over the next three days, the Indian environment experts attending the Paris climate change summit have said, the crisis is a 'full-blown impact' of of global warming. "We are now experiencing the full blown impacts of climate change. The extreme rainfalls that Chennai is experiencing is a direct outcome of our ever warming planet," said Chandra Bhushan, Deputy Director General of Delhi-based Centre for Science and Environment (CSE). Torrential rains have pounded several parts of Chennai and its suburbs along with Puducherry, triggering a deluge that has completely disrupted normal life. Army and disaster management forces have been deployed in Chennai to undertake rescue on a war-footing. "The global average temperature has increased by less than 1 degrees. Think what will happen at 2 degree temperature increase," Mr Bhushan said. Harjeet Singh of Action Aid India, said, "Climate change has always been a contributing factor. We cannot say that it is 100 per cent because of climate change. Here we are talking about the scale of destruction and such rains which have happened after 100 years." Mr Singh also made the Chennai rain crisis a part of his presentation. "If we look at the disasters in the last five years, from Kashmir to Uttarkahand, if we see the trend, it becomes clear that it is because of climate change," he said. The rains, that have broken a 100-year-old record with one day's rainfall covering a month's average, also flooded areas in Vadapalani, Valasaravakkam and Nandamvakkam as nearby lakes overflowed into the city. 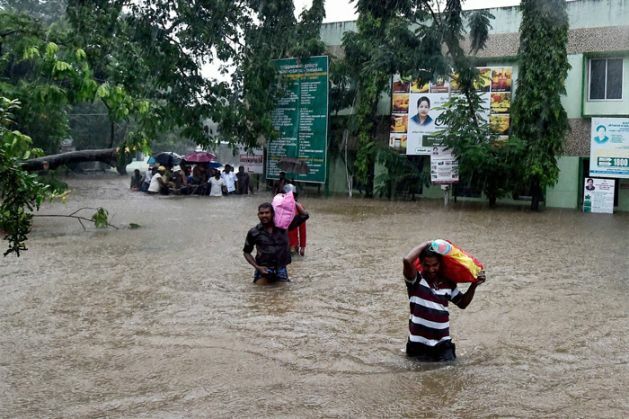 READ NEXT >> #Chennai Floods: "We are holed up and helpless"